A group of bumbling thieves unsuccessfully try to kill an elderly woman (Katie Johnson) who has learned about their latest heist. 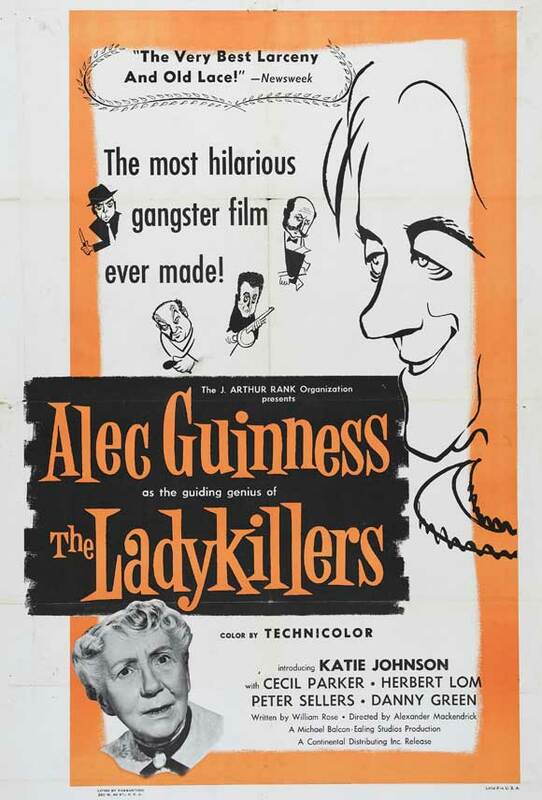 This classic heist-gone-wrong flick showcases the inimitable Alec Guinness — nearly disguised by a shock wig, false teeth, and sunken-eye makeup — at the height of his comedic powers; it’s also notable for the presence of a chubby, uncharacteristically subdued Peter Sellers in one of his earliest movie roles. Most of the film’s humor is derived from the interactions between the befuddled thieves (who find themselves increasingly unable to follow through with their plans) and Mrs. Wilberforce, a true force of nature. As played by Katie Johnson, Mrs. Wilberforce is the epitome of proper British standing: she trusts until she has good reason not to, and maintains firm resolve even in the face of potential danger to her life. 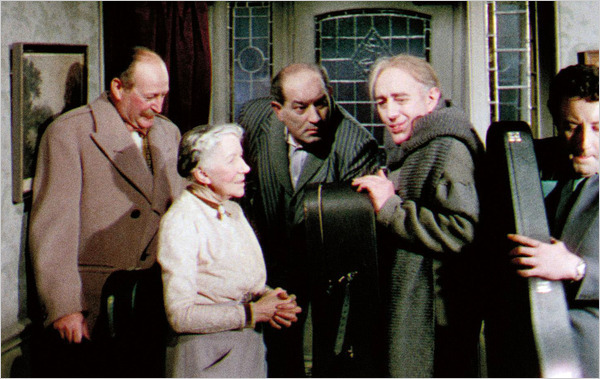 Interestingly, The Ladykillers can be read on another level entirely: as a post-war political commentary about diverse interests (represented by the sundry thugs) struggling to co-exist with older British mores (as epitomized by Mrs. Wilberforce). But I prefer to watch it simply as an engagingly humorous slapstick farce, one in which incompetent thieves get what’s coming to them, and good can’t help but triumph in the end. Yes. This classic British comedy (recently remade by the Coen Brothers) is must-see viewing for all film fanatics. Its power rests in its droll nature. (Early on, potential tenant Guinness is told that the house has “subsided” because of the war; a nice touch since things in the house are about to be quite ‘off’.) Though there are very funny lines – more often than not, they’re tossed off as if unimportant – the film slowly snowballs until the ball itself goes wildly downhill in the last 30 minutes: a very clever conclusion! The film is perfectly cast – and Guinness is his flawless self – but Katie Johnson (in her only film role of renowned significance; she passed away two years later!) is sheer heaven. Her delivery is so natural and underplayed that one might think she walked in off the street. Except that she’s hilarious as well, and that takes a pro. My favorite moment (one of shattered tension) has Johnson entering the room of the five ‘killers’; as she’s about to pour tea, she asks, “Shall I be ‘Mother’?” Indeed! – Johnson IS ‘Mother’, and not about to take nonsense from anyone, least of all five errant, deceitful – all taller – men! Hers is one of the finest comic performances on film. Director Mackendrick (whose work here is spot-on) does not have a long list of memorable titles in his filmography. However, two years later, he gave us the exquisite ‘Sweet Smell of Success’.